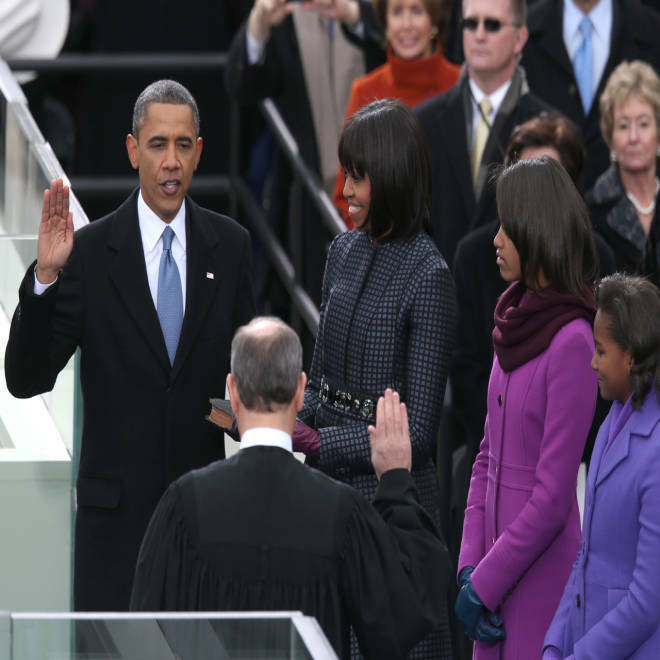 President Barack Obama is sworn in by Supreme Court Chief Justice John Roberts as First lady Michelle Obama and daughters, Sasha Obama and Malia Obama look on during the public ceremonial inauguration on the West Front of the U.S. Capitol on Jan. 21, 2013. Updated 4:33 p.m. — President Barack Obama issued a call to unity in his second inaugural address, urging the nation to move past the divisions that marked the last four years in politics and complete the work of living up to America's founding principles. The president, in a speech that blended together post-partisan rhetoric and policy declarations, highlighted the progress made during his first term to end foreign wars and turn around the economy. But Obama said that there was much unfinished work ahead, and he used Monday's speech to urge political leaders to finally rise above bitter squabbling — a recurring theme of his first term, and a mark of how difficult it has been for Obama to live up to his 2008 vow to change Washington's business as usual. "Our journey is not complete," Obama said during one refrain in his speech. Hundreds of thousands gathered on the National Mall for Barack Obama's second inauguration, a crowning moment after what had been a bruising campaign. NBC's Brian Williams reports. "We cannot mistake absolutism for principle, or substitute spectacle for politics, or treat name-calling as reasoned debate," Obama said. "We must act, knowing that our work will be imperfect. We must act, knowing that today’s victories will be only partial, and that it will be up to those who stand here in four years, and forty years, and four hundred years hence to advance the timeless spirit once conferred to us in a spare Philadelphia hall." Obama and Vice President Joe Biden were sworn in by Chief Justice John Roberts and Supreme Court Associate Justice Sonia Sotomayor, respectively, shortly before noon; Monday's oath of office was ceremonial, following their formal, constitutionally-prescribed swearing-in on Sunday. Monday's ceremonies coincided with the federal holiday honoring Martin Luther King, Jr. Obama nodded to the slain civil rights leader during his speech, and the nation's first African-American president used one of King's Bibles during today's inauguration. The president's speech, though, strode between acknowledging the accomplishments of his first term and the new priorities for his second. The president begins his new term this week intent upon pursuing an ambitious agenda following his decisive re-election victory last November over Republican opponent Mitt Romney. Rebuilding the economy, strengthening entitlement programs for future generations and addressing the threat of climate change were among the initiatives upon which the president touched during his speech. Obama nodded toward other priorities, that were set to define his next four years in office: equal rights for gay and lesbian Americans, immigration reform that offers undocumented residents a pathway to citizenship and new rules to curb gun violence. But as political leaders from both parties looked on from the inaugural platform, Obama avoided much of the hard-charging rhetoric of last year's campaign. Romney, the erstwhile GOP nominee, spent Inauguration Day at his home in La Jolla, Calif., and a former aide told NBC News it was unlikely that the former Massachusetts governor would watch today's festivities. NBC's Chuck Todd and "Meet the Press" moderator David Gregory examine the goals outlined in Barack Obama's second inauguration speech. Obama defended Medicare and Social Security and wants to tackle gun violence and immigration while also advancing gay rights. But in March, Congress will debate how to fund the government – and if they can't come to an agreement about the budget impasse, Obama's other goals will be that much more difficult. Wisconsin Rep. Paul Ryan, Romney's running mate last fall, said today was not a day to emphasize partisan divisions. "But today, we put those disagreements aside," Ryan said in a statement. "Today, we remember what we share in common." To be sure, a variety of bruising political battles between Obama and Congress — in particular, a House of Representatives controlled by Republicans — loomed on the horizon. On Wednesday, Republicans said, they would vote on a measure to extend the nation's debt limit by a few months. Earlier in the day, Obama and the first family attended a service at St. John's Episcopal Church — the "Church of the Presidents," as it is sometimes known — just two blocks from the White House. There, Dr. Luis Leon, the rector of the church, led a series of "prayers for the nation," Washington Cardinal Donald Weurl led a Gospel reading, and an Alexandria, Va., rabbi offered a final blessing. Biden and his wife also attended the service. Former Presidents Bill Clinton and Jimmy Carter were among the dignitaries in attendance during the oath-of-office ceremonies during late Monday morning. Celebrities including musician Jay-Z and actress Eva Longoria joined government officials on the inaugural platform, and attendees were treated to performances by the Brooklyn Tabernacle Choir, Beyonce, Kelly Clarkson and James Taylor. Obama retreated to a traditional luncheon on Capitol Hill following the inaugural ceremonies before participating in the parade down Washington's Pennsylvania Avenue. "I recognize that democracy is not always easy, and I recognize there are profound differences in this room," Obama said in a toast before a bipartisan group of lawmakers, "but I just want to say thank you for your service and I want to thank your families for their service, because regardless of our political persuasions and perspectives, I know that all of us serve because we believe that we can make America for future generations." Afterward, the president and first lady entered the motorcade from the Capitol and back to the White House, leaving the presidential motorcade at moments to walk for a portion of the trip. The president and first lady will make their way to glitzy, black-tie inaugural balls later this evening before wrapping the whirlwind day of festivities.